_ Present innovative concepts of hard landscaping and planting design that are more sustainable in the Mediterranean context. _ Participants are invited to interpret these themes and develop design solutions that integrate these themes and make them understandable and presentable to the public at large. The LE:NOTRE Institute organises this competition for the EXPO 2016 in Antalya in collaboration with the landscape architecture department of Akdeniz University. 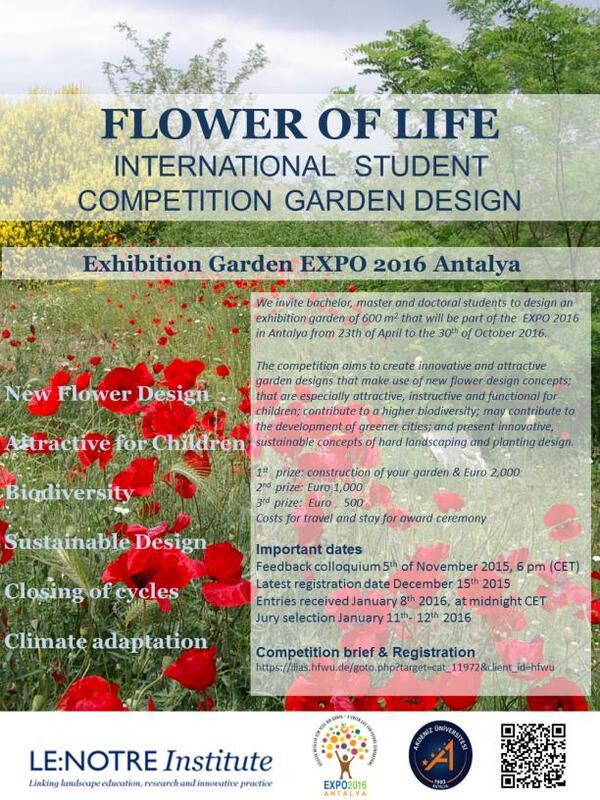 1st prize: costs for travel and stay 3 days (5 star hotel) for the winner and his/her family (up to 4 persons) to Antalya to attend the prize winning ceremony, €2,000 prize money and construction of the garden in the EXPO, certificate. 2nd prize: costs for travel and stay 3 days (5 star hotel) for the prize winner and a friend /family-member (up to 2 persons) to Antalyato attend the prize winning ceremony, €1,000 prize money and certificate.